I like the colors and shadows in this shot. 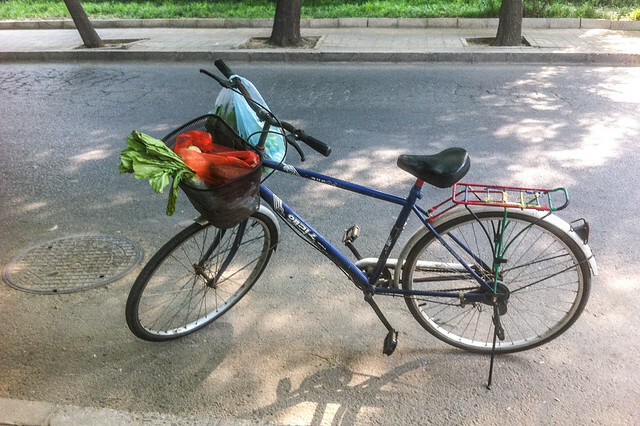 Also, how it shows how some folks still rely on the bicycle not only as transportation from point A to B, but as a vehicle to carry vegetables, fruits, and many other types of items. And, I won’t mention how it was parked in the street in opposition to the flow of traffic. The bicycle right outside the shop where I get my morning bread when I go into work. Posted in Beijing Youjian on 2012-05-13 by sujinyan.